Here are some facts about Mary Anning, the fossil collector and paleontologist. Mary Anning was born on 21st May 1799 in Lyme Regis, Dorset. Her father, Richard Anning, was a cabinetmaker and amateur fossil hunter. When she was only fifteen months old, Mary Anning survived being struck by lightning. She was in the arms of a neighbour under an elm tree, when a bolt of lightning struck the tree. The lightning killed the neighbour who was holding Mary, and it killed two other women, but Mary was unhurt. Mary attended a Congregationalist Sunday School ans she learnt to read and write. Her father often took Mary and her brother, Jospeh, fossil hunting around the cliffs of Lyme Regis. They sold their finds to tourists. When Mary’s father died in 1810, the remaining family members focused on growing their fossil hunting / selling business. Mary became an expert fossil hunter. She spent days looking for fossils in the cliffs around Lyme Regis. Fossil collecting was dangerous work. The cliffs could collapse at any moment and landslides were common. Mary’s dog, Tray, was killed when he was hit by falling rocks. She found her first complete Plesiosaurus skeleton on 10th December 1823. She also found various pterosaurs and a Squaloraja skeleton. Mary had an incredible understanding of fossils and dinosaur skeletons. It was said that she could just glance at a fossil and immediately work out what it was and which dinosaur it came from. 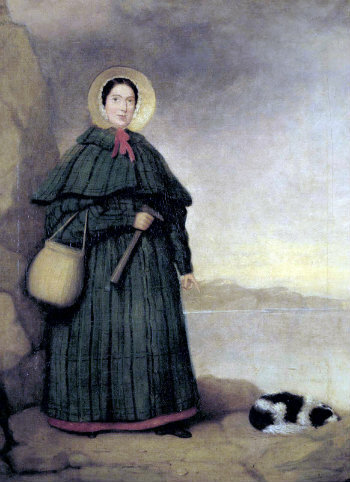 Mary Anning and her family sold fossils to museums and collectors all over the world. She was good friends with the geologists Henry De la Beche, William Buckland and Richard Owen. Mary was also in contact with the geologist Adam Sedgwick, one of Charles Darwin‘s tutors. Although she knew more about fossils than many of the experts who visited her in Lyme Regis, because she was a woman and because she was a member of the working class, she wasn’t completely accepted by the 19th century British scientific community. Mary Anning died on 9th March 1847. She had breast cancer. Charles Dickens wrote an article about Mary, celebrating her life and achievements. Anning is one of the main characters in the book Remarkable Creatures by Tracy Chevalier. Apparently, Mary Anning was the inspiration for Terry Sullivan’s tongue twister, She Sells Seashells. Mary was good friends with Elizabeth Philpot, another fossil collector from Lyme Regis. What next? Discover more facts about famous Victorians or visit our Victorians resources page. I used this for my homework it was very useful. It is very useful. I hope I get an a plus. Glad we were able to help you out. Thanks, Morgan! Omg now I can finish my year 6 homework! Now I can do my homework! My second grader was talking about Mary Anning. I had to check his facts; he was correct! I used this for my homework. It was fabulous!!! Thanks so much for the information i used it for homework. helped me with my homework thx! Thanks so much! It took me so long to find a female scientist that suited. Thanks again. Thanks so much for the help!!!! Year 6 work is so hard! !